🎙Yesterday's Pro Rata podcast led with how 5G could create a new digital divide based on geography. Listen and subscribe via Apple, Spotify or other platforms. Qualcomm has officially killed its $44 billion pursuit of Dutch chipmaker NXP Semiconductor, after failing to secure Chinese regulatory approval. Qualcomm owes a $2 billion break-up fee. Both Qualcomm and NXP announced large stock buybacks. 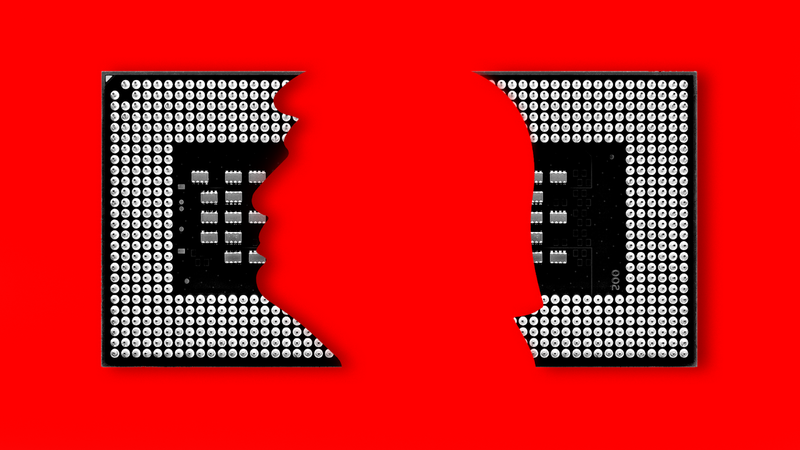 Axios' Ina Fried writes: "Even with a buyback, Qualcomm will be under pressure to show that it can grow its chip business significantly beyond its cell phone roots, while ideally also maintaining its licensing business." The bottom line is that President Trump has impacted Qualcomm more than than any other large, U.S. company. First, he saved it from a hostile takeover attempt by Broadcom, preemptively blocking the deal on national security grounds. But now his trade tiff with China has arguably killed Qualcomm's own takeover initiative. • Read all about it: Politico reported yesterday that "a private equity firm has made a bid to buy Tronc." A source familiar with the situation tells me that two private equity firms are actually still in the process, and that one of them is Apollo Global Management. A strategic bidder also continues to circle, but seems to be a very long shot at this point. And, no, SoftBank is no longer involved. • Recommended reading: An Axios analysis shows that S&P 500 CEOs took home billions more last year than you may have realized, and certainly more than the headline figures touted by their companies. Bob Herman has the details. • High note: Spotify today reported earnings that were mostly in line with analyst expectations, and CFO Barry McCarthy (ex-Netflix) told me during an early media call that the company's direct listing in April "went more smoothly than I thought it would." McCarthy isn't sure why the stock price stabilized so quickly, but offered up: "It's possible that the wisdom of the crowd works faster than we theorized, and the fact that we had an active secondary market from the early stages of the company's development probably contributed to a successful open." • Facebook lost around $123 billion in value at the open this morning, following yesterday's post-market earnings report that missed revenue and user growth estimates. Why it really matters. • Bloom Energy's zipped-lip PR strategy paid off yesterday, as its stock popped 67% on the first day of trading. • Sugar shame: Two months after buying candy-maker Necco in a bankruptcy auction for $17 million, an investment firm affiliated with Dean Metropoulos just stunned 230 factory workers in Revere, Mass. — telling them the facility would shut immediately, and that Friday will be their last payday. Revere's mayor says the private equity shop, called Round Hill Investments, gave his office no notice. I emailed Daren Metropoulos, but got no reply. The firm did tell local media that it decided to sell the entire business to "another national confection manufacturer,"without disclosing the buyer's name. Flywire, a Boston-based provider of cross-border payment solutions, raised $100 million in Series D funding. Temasek led, and was joined by return backers F-Prime Capital Partners and Bain Capital Ventures. Why it's the BFD: Because while most payment startups are aimed at the long-tail of small transactions, Flywire is focused on large, invoice-type payments in areas like education, B2B and healthcare. 50/50: Half the deal was primary capital, while the rest was secondary (i.e., bought from early shareholders). Bottom line: The company, originally known as PeerTransfer, says it has processed over $8 billion in payments for 1,400 clients, and currently has around 300 employees spread out over 10 offices. 🚑 Inversago Pharma, a Montreal-based drug developer focused on metabolic diseases, raised C$7 million in Series A funding. Genesys Capital and Amorchem co-led, and were joined by the JDRF T1D Fund, Accel-Rx, Anges Québec Capital, Anges Québec and Tarnagulla Ventures. • F2i agreed to buy RTR, a portfolio of Italian solar energy assets, from Terra Firma for €1.3 billion. • Cango, a Chinese used car marketplace, raised $44 million in its IPO. The company priced 4 million shares at $11, compared to original plans to offer 112.5 million shares at $10-$12. It will trade on the NYSE (CANG) while Morgan Stanley was lead underwriter. Shareholders include Warburg Pincus (18.2% pre-IPO stake), Didi Chuxing (14.8%) and Tencent (10.7%). • Pinduoduo, a Chinese discounted e-commerce site focused on group buying, raised $1.6 billion in its IPO. The company priced 85.6 million shares at $19 (high end of range), for a $24 billion market cap. It will trade on the Nasdaq (PDD) while Credit Suisse as lead underwriter. Pinduoduo reports a $32 million net loss on $220 million in revenue for Q1 2018, and is backed by Tencent (18.5% stake), Banyan Capital (10.1%) and Sequoia Capital (7.4%). • Tenable, a Columbia, Md.-based cybersecurity and compliance monitoring platform, raised $251 million in its IPO. The company priced 10.9 million shares at $23, compared to original plans to sell 9.2 million shares at $17-$19. It will trade on the Nasdaq (TENB) while Morgan Stanley as lead underwriter. Tenable reports a $16 million net loss on $59 million in revenue for Q1 2018, compared to a $9 million net loss on $40 million for the year-earlier period. The company raised around $300 million in VC funding from firms like Insight Venture Partners (35.3% stake) and Accel (34.4%). Q2 GDP figures come Friday morning. The Atlanta Fed predicts 4.5% growth, but the New York Fed's "Nowcast" is at 2.7%. U.S. GDP growth hasn't topped 4% since 2014.